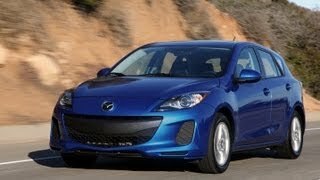 Mazda 3 2012 made its US debut at the New York Auto Show 2011. The new Mazda 3, Mazda's best seller world-wide, gets a face-lift with a refined exterior and interior as well as a boost in fuel economy (up to 40mpg Hwy). Check it out after the jump. NEW YORK (April 21, 2011) - The 2012 Mazda3 made its U.S. debut today at the New York International Auto Show. Face-lifted with an even more refined exterior and interior, the 2012 Mazda3 also is the first application in North America of Mazda's innovative SKYACTIV fuel-saving and performance-oriented technologies, achieving 40 mpg on the highway. The Mazda3 model is Mazda's best-selling vehicle worldwide and accounts for nearly half of all Mazda sales in the United States, making the vehicle a prime candidate for introducing SKYACTIV to consumers looking for dynamic performance coupled with high fuel efficiency. "SKYACTIV is not just an engine; it is the next generation of advanced vehicle performance and efficiency," said Jim O'Sullivan, President and CEO, Mazda North American Operations (MNAO). "SKYACTIV embodies Mazda's philosophy of engineering only vehicles that are fun to drive, satisfying to own and environmentally responsible; and there is no better vehicle to start with than the Mazda3, one of the most exciting sport compact cars on the road." Redesigned for the 2010 model year, the refreshed 2012 Mazda3 is Mazda's first application of SKYACTIV technologies in North America, receiving an all-new SKYACTIV-G gasoline engine as well as the all-new SKYACTIV-Drive six-speed automatic transmission and all-new SKYACTIV-MT six-speed manual transmission. It also features improved sporty driving dynamics, responsive handling and a comfortable cabin space. The exterior design also has been refined to express a bolder stance, alongside new interior appointments creating additional functionality without sacrificing the touch-and-feel quality. Additional safety features complete the package. In addition to the Mazda3's current MZR 2.0-liter dual-overhead-cam 16-valve four-cylinder engine is the all-new high-efficiency direct-injection SKYACTIV-G 2.0-liter gasoline engine. Mated to a standard SKYACTIV-MT six-speed manual transmission or optional SKYACTIV-Drive six-speed automatic transmission, SKYACTIV will be available in either the sedan or hatchback models. The MZR 2.0-liter engine will continue to be available with the current five-speed manual as standard equipment. MZR 2.0-liter-equipped models also will be available with the current five-speed automatic as an option. Also, previously only available with the MZR 2.5-liter engine, the Mazda3 five-door hatchback model will now be offered in the U.S. with the SKYACTIV-G 2.0-liter gasoline engine. 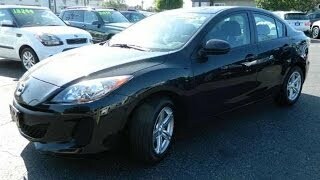 This Mazda3 hatchback is estimated to deliver 27 city/38 highway (SKYACTIV-MT) and 28 city/38 highway (SKYACTIV-Drive AT). The slightly lower highway estimates can be attributed to different aerodynamics and the higher weight ratio between the sedan and hatchback. However, the hatchback's driving range remains impressive with more than 500 miles of driving on the same sized tank as the sedan. The MZR 2.0-liter engine will not be available in the hatchback model. 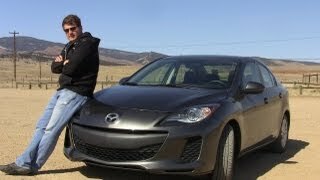 The higher fuel economy of the 2012 Mazda3 equipped with SKYACTIV is a direct result of combining all the best features of the technology in today's transmissions. For SKYACTIV-Drive, the key advantages of a conventional automatic transmission, Continuously Variable Transmission (CVT) and Dual Clutch Transmission (DCT) were integrated. In addition, a torque converter with a lock-up clutch was developed to ensure minimal decrease in fuel economy and an increase in direct drive feel. For SKYACTIV-MT, the goal was to achieve a shift feel that is sporty, brisk and responds to the driver. To accomplish this, not only was the shift-lever stroke shortened by about 10 percent compared to the current six-speed manual (available only in models equipped with the MZR 2.5-liter engine or MZR 2.3-liter Direct-Injection Spark Ignition turbo engine) but other technologies were applied as well: a down type system, lock ball type synchronizer, shift load canceller, slide ball bearing and locating 2nd and 3rd gears on a common shaft. By reconfiguring the current six-speed manual transmission, its weight was reduced by approximately 4.4 pounds due to the need for fewer components, while creating a quicker and crisper shift feel. Call it a little "MX-5 Miata-ness" in the Mazda3. The Mazda3 has earned a solid reputation for its sporty and exciting handling that delivers an equally pleasurable driving feel which emphasizes consistency between the driver's expectations and the car's response. 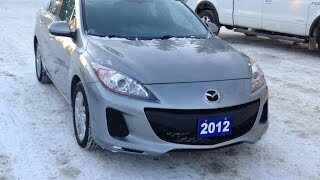 Inheriting this pedigree, the refreshed 2012 Mazda3 not only improves upon this sense of oneness between driver and vehicle, but also offers a comfortable driving experience that all passengers can feel and enjoy in various driving scenarios. Referred to as Toitsukan, this linear and consistent feel is more specifically about establishing smooth transitions between acceleration, lateral and deceleration G forces in response to the basic aspects of driving, turning and stopping. This idea is not simply about delivering sharp response to accelerator and steering operations for a sporty ride, but instead delivering a consistent linear feeling of the car's every response to control operations of the driver. Toitsukan extends to making driving pleasurable and instilling drivers with the sensation of excitement and control while at the same time offering passengers a comfortable ride created by smooth and stable car movement. Concentrated efforts were made to ensure this Toitsukan is achieved throughout the car's features, which also resulted in a stronger body, include the adoption of the Electro-Hydraulic Power Assist Steering (EHPAS) system and optimized tuning of the front and rear dampers. Mazda's EHPAS system employs a new setting for pump flow characteristics that enables easier handling at slow speeds while also achieving more positive feedback and a better feeling for the road at mid-range through to high speeds. The overall result when compared to the current model is lighter, more nimble steering feel. The body of the 2012 Mazda3 also has been further reinforced for greater rigidity, improving upon the current model's already stellar agility and handling stability. This was partly achieved by increasing the number of spot welds used to join the suspension crossmembers (to which the front and rear suspensions are mounted) to the reinforced body areas. Use of stronger materials for reinforcements made it possible to more effectively disperse input from the suspension crossmember mounts to the body, thereby greatly improving overall body rigidity. In addition, the two reinforcement bars located under the center of the floor panel of the current Mazda3 were replaced by a single new brace that is both stronger and more rigid. Employing this sheet of reinforcing material suppresses fore-aft body deformation. This update applies only to models equipped with the SKYACTIV-G 2.0-liter or MZR 2.5-liter engines. Additionally, models powered by SKYACTIV-G 2.0-liter gasoline engines are equipped with a drive control system that controls torque generation to maintain a harmonious balance between engine output and the gears of the transmission. Programmed in such a way to determine how much acceleration is called for in relation to the amount of acceleration pedal action, the system ensures the right amount of torque generated matches the acceleration demands. This instills in the driver a sense of confidence that the vehicle will respond faithfully and predictably. A driver's desired speed can be reached without the need of a heavy foot on the accelerator, thus contributing to less waste of fuel. This mid-generation evolution of the Mazda3 also extends to its exterior design. The current model's rich expression and bold stance has been updated to deliver a well-toned look that conveys even higher quality and curb appeal. Increased aerodynamics and stylized features give the 2012 Mazda3 a more sophisticated look, blending seamlessly with functionality. The 2012 Mazda3's exterior appearance ultimately features a more taut impression with a new front fascia and updated five-point grille opening for both sedan and hatchback styles. New design characteristics include more delicately sculpted forms around the openings on the outside edge of the front bumper and a rounded fog lamp shape (changed from the horizontally-wide version of the current model). Mazda3 sedan and hatchback models equipped with SKYACTIV-G gasoline engines will be further distinguished with exclusive elements, such as an all-new engine cover featuring a deep blue metallic paint finish with black sections along either side; headlamp units outfitted with a transparent blue ring around the center lens to emphasize the vehicle's distinctive character; and a badge featuring a "SKYACTIV" logo against a clear-blue background. Aerodynamics plays heavily to a vehicle's carbon footprint. Improved aerodynamic performance yields greater fuel economy and further reduces CO2 emissions while also contributing to handling stability. With this in mind, the front bumper design was optimized, as were underbody parts, to more effectively streamline the flow of air traveling beneath the floor. The shape of the lower sections of the front bumper's sides were redesigned to protrude forward and the fins beneath were made larger. This adjustment effectively distributes the flow of air hitting the engine compartment and the front tire deflector, suppressing turbulence in cooling the engine as well as along the sides of the body. The devil truly is in the details, and Mazda's engineers didn't miss a single one. The end result is a 0.27 Cd for the sedan (SKYACTIV-equipped model only), an approximately seven-percent improvement over the 0.29 Cd of current models. The hatchback version has a 0.29 Cd (SKYACTIV-equipped model only), also an approximately seven-percent increase over the 0.31 Cd of current models. The refreshed exterior look is completed with all-new 16- and 17-inch aluminum wheel designs. The 16-inch wheel (on all SKYACTIV models) now features 10 twisted-surface spokes, increased from the current model's seven-spoke design, and the 17-inch wheel (on 2.5-liter s models) is characterized by enlarged openings between each spoke, creating a look that adds to a lighter yet more dynamic feel. Designs for the 16-inch steel wheels and 18-inch aluminum wheels remain unchanged. The interior design was no less re-imagined than the vehicle's exterior, and was developed with the end goals of a more inviting cabin and higher quality feel. Beginning with the instrument panel - the largest landscape within the cabin - black is now used throughout the center stack and shift gate to provide an even bolder look. Also, silver-colored, satin-polished details were added to areas frequently operated by consumers, such as the outer rings of the three climate-control dial switches and the audio control panel, as well as the ventilation louvers on the center panel. In addition to creating a feeling of higher refinement, the silver-on-black color scheme further accentuates the location of these common controls and switches, which increases legibility and lessens the amount of time drivers take their eyes off the road, consequently reducing operating errors. Proving that even on a mid-cycle refresh, engineers truly sweat the details, the amount of the shift knob head's forward projection on SKYACTIV-Drive equipped models has been increased by nearly 0.16 inches over the current model, resulting in a better grip feel and smoother shifts in both front-aft and left-right directions. 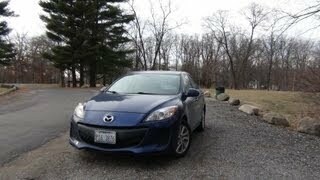 All Mazda3 and MAZDASPEED3 models will continue to be equipped with a high level of standard safety features. An optional feature available for 2012 models is a new Blind Spot Monitoring (BSM) system. The BSM system aids drivers in avoiding accidents that often occur in tight-spaced situations, such as brushing up against another vehicle during lane changes and traffic merges. 24GHz radar sensors located at the rear of the vehicle aim to detect approaching vehicles within a range of 13 feet to the left or right, and within 26 feet from the rear. When a vehicle is detected entering the blind spot area, indicator lamps housed within the door mirrors will light. If a turn signal is activated while the indicators are lit, they flash and a buzzer serves as an additional warning. Also available as an option is an Adaptive Front-Lighting System (AFS) with auto-leveling bi-xenon headlamps. AFS provides a wider range of vision during cornering, increasing the driver's gaze point and visible distance, by taking into account both steering angle and vehicle speed to orient the headlamps to an angle. All Mazda3s, regardless of trim level or engine choice, will continue to feature Mazda's own highly rigid safety body structure, which incorporates crushable outer zones that absorb impact energy, and Mazda's Triple H construction, which applies H-shaped reinforcements to the floor, side frames and roof to suppress cabin deformation and minimize the likelihood of bodily injury during an impact. For 2012 models, the B-pillar reinforcement has been extended by more than seven inches and more high tensile steel was added to further increase body rigidity. Standard advanced safety features include six airbags (advanced dual front, front-seat mounted and full-length side curtain) with improved double chamber side airbags, anti-lock brakes (ABS) with Electronic Brakeforce Distribution (EBD) with Brake Assist, Dynamic Stability Control (DSC) with a Traction Control System (TCS), front and rear stabilizer bars, a Tire Pressure Monitoring System (TPMS), a "crushable" brake and accelerator pedal assembly and collapsible steering column, three-point safety belts for all seating positions, front seatbelt pretensioners with force limiters as well as Lower Anchors and Tethers for Children (LATCH). On Mazda3, safety is simply not an option.